There are many reasons that you or your Quiz maker Assistants may want to reopen an exam, once the test-taker has completed it. A test-taker may have had a computer crash, internet connection issue or maybe there's a time limit on the test and for some reason, they could not complete this test in time and you would like to give them additional time. Whatever the reason may be, the question comes to mind "How can I reopen an online test that has been submitted as finished?" 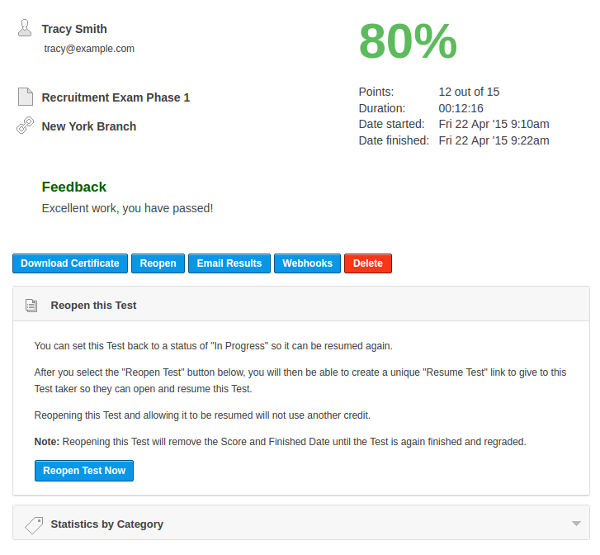 With ClassMarker, you can reopen completed tests quickly and easily. 'Reopen' button that is displayed right above the answers that the user has provided. "You can set this Test back to a status of "In Progress" so it can be resumed again. After you select the "Reopen Test" button below, you will then be able to create a unique "Resume Test" link to give to this Test taker so they can open and resume this Test. Reopening this Test and allowing it to be resumed will not use another credit. Note: Reopening this Test will remove the Score and Finished Date until the Test is again finished and regraded." Confirm the reopening of the Test by clicking on 'Reopen Test'. 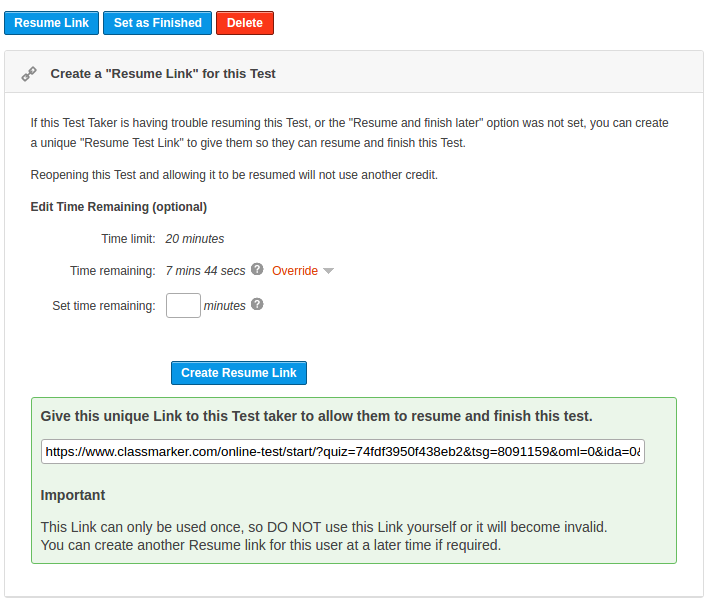 Resume Link will allow you to provide a test-taker with this link so that it can be resumed again. Set as Finished will allow you to set the Test as completed for those users who are not going to finish the test. ClassMarker will calculate the score from the Questions that have been attempted. Delete will allow you to delete the Test result. Please Note: Deletions are permanent. Also, if results are set to be emailed, they cannot be emailed if the results are deleted. It couldn't be any easier to reopen an online quiz. Just 2 clicks! Register here and start creating online exams and quizzes today. How do I Embed Exams and Quizzes on my Website? How to add an Assistant? How do I Give Access to my Tests?